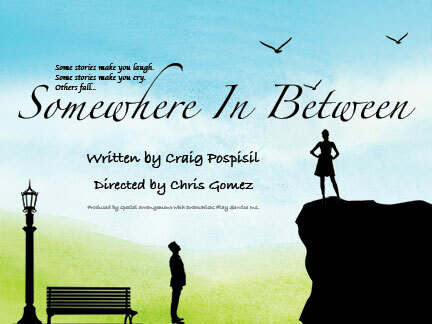 A romantic comedy by Craig Pospisil Produced by special arrangement with Dramatists Play Service. The comedy follows 29-year-old Jasper as he learns to cope with the inevitable curves life throws you. Told through ten scenes, Jasper finds himself between floors, between the sheets, between the lines, between the cracks, between jobs, before ending up Somewhere in Between.